Japan is hoping to boost tourism by using one of the most famous figures from its history - the ninja. 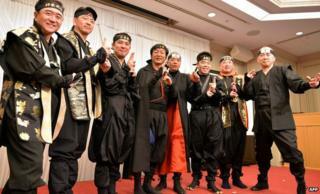 A "ninja council" has been set up by mayors and governors from around the country, who ditched their office wear in favour of ninja gear to launch the new initiative, the Japan Times reports. Officials are hoping that global interest in the mysterious figures will encourage people to visit Japan. It's a "subject that always comes up whenever we go abroad to promote tourism," says Hiroshi Mizohata, former head Japan's Tourism Agency. The council wants local authorities and tourism bodies to put the ninja front and centre - a position the stealth assassins historically tried to avoid, the report points out. It will also be holding ninja-related events. "Through ninja, we want to revive our communities," says Eikei Suzuki, the governor of Mie prefecture, who joined his colleagues in donning the black attire. The Mie region includes the city of Iga, often referred to as the "home of ninja" because it had a famed school of ninjutsu - or ninja techniques. Mie University even offers a course in ninja studies, which includes lessons in how to walk stealthily. Ninjas were traditionally mercenaries hired by warring states in the 15th and 16th centuries, before Japan was unified. While they were skilled in armed combat and famed for being able to "disappear", experts say they tried to avoid fighting wherever possible - espionage and intelligence gathering were their main strengths.